I want to take off the top of my head and let you know where my mind is coming from today before I jump into my sermon. I, like many of us, are swirling from the recent headlines: Supreme Court decisions, treaties with Iran, the beginning of the end for the Confederate Battle flag. 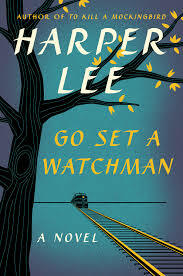 All this milieu is swirling, and like many a book lover, this week I have been pre-occupied with ignoring comments while I read Harper Lee’s old new book, Go Set A Watchman. I finished it last night, and the old, familiar territory of the inner battles over the social ills of racism and misuse of power were trudged through again by Ms. Lee. While it was nowhere near the classic To Kill A Mockingbird, it does round out characters. It is more of a prequel really, in that Scout and Ms. Lee needed to excise the ghosts Go Set A Watchman so that we could get to the gold that is To Kill A Mockingbird. One passage struck me and led directly to my mindset coming to the sermon today. At the beginning of Chapter Nine there is a paragraph encapsulating the icon that is Atticus Finch. Despite what the headlines have declared about this book, this, I think, is more in line with a character I hold so dear. After that long premise, my apologies, let us embark. There is a narrative that we have allowed to play out in our society and in our lives. We hear it on the playground, between the bickering children. The problem with the Us and Them mentality is that we have to tear Them down to build Us up. We have to challenge their very humanity, to maintain our power and self-understanding. Do the children see it this way? No. They are the badguys. We are the goodguys. “They are the Cowboys; we are the Indians. We are the Cops; they are the Robbers. They are the Aliens; we are the Astronauts.” It has been part of human nature since the very beginning. Caan felt he was becoming an outsider, and his brother Abel became the Other to him, so Caan killed Abel. It is much easier to kill an Other than it is to kill a Brother. Philip Jenkins in his fascinating book, The Great and Holy War, about the religious arguments used to justify the atrocities of the First World War, details the rhetoric that helped dehumanize the enemies, on both sides mind you, and turn a battle of nation states into a battle of Good vs. Evil. There was a reason they called this the War to End All Wars. A battle of the Godly versus the forces of Satan, BOTH sides proclaimed. The problem is once you open the bottle of rhetoric like this, you cannot get it back in. Like in Ghostbusters when the spooks and haunts they caught are suddenly released, the city goes amuck. It has happened since time immemorial and it happens still today. Look at the political pages, if you cannot attack the argument, attack your opponent’s character or his right to serve. Even in our denominational woes of the last decade, people argue that they are the True Christians, and their opponents have “lost their way,” or that they have “departed the true faith.” Over and over and over and over, this same story is told, and, God help us, we have to find another way. We have to tell a different story. Think of how the world would be different if we moved from an Us and Them narrative, and moved to a We narrative. Everyone is us. We are Everyone. It was a struggle in the early Church, and it is a struggle in this Church, too. Whenever you have people there is a struggle. I am not belittling anyone here, please believe me. But watch your language, watch the third person plurals, They and Them. Watch the euphemisms, our fill-in-the-blank-with-whatever friends or fill-in-the-blank neighbors. This is just a nicer way to draw a line. It may be dotted, but it is still a line. Paul was tackling the Us and Them divisions in the Church at Ephesus. Now put it in context, Paul, when he was called Saul, used to go around and kill people who were in the Church for having departed the True Faith, the faith and practices of Pharisaical Judaism. In the stoning of Stephen which he helped orchestrate, he saw himself as doing the Lord’s work. Sidenote, be very wary of the the people claiming they are doing the Lord’s work as they can justify and rationalize anything. The scriptures and the headlines back that up repeatedly. This is why Communities of Faith are imperative, to hold us all accountable. Back to Paul! He has come as far from his former self as can be. Before he “saw the Light,” both literally and figuratively, he fought and killed for that Us and Them narrative. In Ephesians he looks at those that were Uncircumcised and therefore outside the Abrahamic Covenant, and he brings them into the very household of God. I love today’s reading from Ephesians 2. Three verses really stick out, though, that drew my mind to today’s sermon. 2:14 For he [Jesus] is our peace; in his flesh he has made both groups into one and has broken down the dividing wall, that is, the hostility between us. 15 He has abolished the law with its commandments and ordinances, that he might create in himself one new humanity in place of the two, thus making peace, 16 and might reconcile both groups to God in one body through the cross, thus putting to death that hostility through it. Those that were Them are now Us, and those that are Us are joined to and reconciled those we considered Them. The Us cannot be saved without the Them. We, Us and Them, need each other. In the conversations taking place in our coffee shops and protest marches, in our conservative churches and our liberal ones, in our living rooms and around our kitchen tables, and in heart of hearts in the dark of night, we wrestle still with who is Us, and therefore Good, and who is Them, and therefore Not Good. Who is In? And, Who is Out? If we change the narrative to the one Paul is arguing for with the Ephesians, we can stop worrying about Them. And we can see all God’s Children as the We, and if we cannot take it that far, I would argue, we can at least begin to see others as a possible We Becoming. It is so hard, though. So hard. When someone reduces me to the Them, it is almost impossible to begin the process of moving toward the We. But it can happen, it is long and hard, but it can happen. Doing research for today, I learned of a letter that Gandhi wrote to Hitler, asking for an end to the violence of war. Naive? It can easily be seen that way. So could Nelson Mandela and Archbishop Desmond Tutu in the their approach with the Truth and Reconciliation Committee after Apartheid South Africa. Tell the truth and you will be forgiven, officially and permanently. Or as Jesus said, “The truth shall set you free.” Naive, or a different way of being? I choose the latter. It would be very easy to get down. To be discouraged. There are so many who are doing so much for so many, and often it feels like we have barely turned the ship of our state, and to those we have the comforting words of Jesus to his disciples today. Jesus knows what he is asking of us. Jesus knows what it means to love one’s enemies, because Jesus loved his enemies. Jesus knows what it means to turn the other cheek, because he had to turn the other cheek. We follow a Lord who is asking of us what he himself did. He had sent out his followers to teach, heal and cast out evil. They returned and shared their adventures and triumphs, and I am sure he saw in their eyes how exhausted they were. Mark 6: 31"Come away to a deserted place,” Jesus said, “all by yourselves and rest a while." For many were coming and going, and they had no leisure even to eat. Now our reading for the day does not show it, but tucked between verses 34 and 53 is the feeding of the 5,000 [Men]. Not a small tale, or a simple event. But the lectionary chose to emphasize the coming to Jesus and finding our peace. When the days are dark, and the way forward is unclear, I can give no better advice than that. Let us come away with Jesus and rest awhile. Jesus did it. He taught his disciples to do it. We need to do it, too. Especially as we are the Salt of the Earth and the Light of the World, helping all God’s Children tear down the walls that divide and use those bricks to build up the very Household of God. As we draw closer to Jesus, may he give us the strength to hold all with the gaze of compassion, and may he Shepherd us all to the We we hopefully are Becoming. Amen. I have just finished "Go Set A Watchman" by Harper Lee. For years I have been praying that there would be more from a favorite author, and I was ecstatic when I heard the news that something further was coming out. With dread I read the stories of her being taken advantage of by unscrupulous agents acting on her behalf after the death of her sister who had protected her legacy for decades. For good or ill, it is out there, and I knew I would buy it and read it no matter what. I loved "To Kill a Mockingbird" that much. For the last 4 years I have taught the book to African-American 8th graders, and the conversations that ensued on race and power in America were some of the highlights of my teaching career. So what of "Go Set A Watchman"? "Go Set A Watchman" is a novel unto itself. It can and should be judged on its own merits, though it uses beloved icons of American literature and the awkward and nostalgia-inducing Maycomb County, Alabama. Do we trust anyone, even Harper Lee, with furthering our mental images? Some will say no. I, for one, found Harper Lee's "Go Set A Watchman" an admirable continuation of a beloved novel. It could very well have been titled Scout Finch Comes of Age. It follows only four days of a return visit home by the 26 year old Jean Louise, and during that time she becomes her own person. I would recommend it to anyone, especially those for whom the first novel was a touchstone. What I find most remarkable about the book is that it is still poignant and applicable today, even though it was supposedly written decades ago. We are still fighting the same battles, and we are still waging the same wars. Outcomes may be different, but the atrocities of Charleston a month ago and the ensuing conversations/arguments over the Confederate Battle Flag fit hand in glove with the premise and passion of this book. What does it mean to be Southern and white now? What does it mean to care about so many things one can hold dear but not embrace the totality of the Southern legacy? There are not easy answers and this is not an easy book. Do not hear me saying that it is. I read To Kill A Mockingbird with children. I would want to read this with them 8 years later, when the adolescent black and white perspective can be let go and we can go on to ask ourselves, how do we live in the gray? Read it. Decide where you stand. Wherever you land, may we come together and talk it through. A lot of people ask me what is Family Camp like. There have been lots of metaphors tossed out, like a weeklong parish retreat where we create a parish. Or like our keynote speaker shared this week, “This should not be called Family Camp, but rather Camp Family.” And then he thanked us for making him a part of our family. At meal times, we could easily be called Camp Gluttony because Shrine Mont feeds us too well. But what exactly is it we do all day? Our day starts at 8:00 am with breakfast served family style around tables, and then we head to the Rec Hall for a time of singing with our phenomenal pick-up band (many of these guys have been playing together for years, or minutes) followed by Morning Prayer. Then adults have a speaker/leader, while kids and youth have their own programming. This goes to about noon, when we gather for Noontime Prayers or Holy Communion. Lunch leads to afternoons, where families go to the pool, on a hike, fishing, or maybe one of the programs we offer. Many of us take much needed naps, too! Dinner rolls around, and once again, we are well taken care of by the wonderful Shrine Mont staff. Every evening we have a fun family activity. A dance, BINGO, a carnival, movie night, and the beloved Talent Show are all ways to be together as a group, enriching and encouraging families. The days follow a leisurely pace, and people pick and choose what they will participate in. Some people do everything, and some show up for meals. The freedom and flexibility lets people do what they need to do for themselves and their families. This experience is all about enabling you and your family having space to draw closer to God and to each other, and making lots of friends in Christ in the process. Hope you will join us next year! Note: This was a blog entry originally written for shrinemontcamps.net in my role as Director of Family Camp. In my short tenure as Director of Family Camp I have learned a few things. Some of them were expected, the whos, the whats, the wheres, the whys. That is the learning curve of any new job. But in my second and third years, it was not the details that came out about family camp, it was the atmosphere that makes it so special. It is not the trees, but the forest. For many DECADES, yes decades not years, Family Camp was known as Family Conference and had a who’s who of speakers from around the Episcopal Church. Presiding Bishop Elect Michael Curry is even among those that have shared their wisdom and love of God during our times together. The Family Conference started at Shrine Mont in 1952, and its has gone through many changes and transitions, but at its core it is still about coming with your family to increase your love of God and love of each other. Could anything be better? Every year we gather from all over the Diocese, and some from further afield, to pray, worship, sing, grow, learn, and have fun. It is Camp after all. You have to have the fun. What makes it wonderful is that we have fun while we pray, worship, sing, grow and learn. The unique thing about Family Camp is that it is not age-specific. The other camps are separated by age, but we are multi-generational. The kids see the adults enjoying the same things and celebrating together, and vice versa. Even more important, during this week we form a village where we look after and support one another. This week, my daughter had a low moment, and someone reached out, processed the moment, and gave her space to talk and come to a better place. It would have been different if I had done it. Your dad has to love you, right? But that an adult took her seriously and lovingly listened, she felt empowered, and I felt encouraged. Of all the many things I have learned along the way, this is the most important. I need Family Camp. I think we all need a Family Camp in our life. I have a space where I can care and be cared for. I need a time when I can let go of the stuff I carry in my day to day life, and relax, rejuvenate, and just be. I need a place apart, but I also need a space to be together. Shrine Mont is the place apart, but Family Camp is the space to be together. Thank you, God, for Family Camp. Note: This was a blog entry I wrote for shrinemontcamps.net in my role as Director of Family Camp.